​​FARMERS BRANCH – Developer Mehrdad Moayedi plans to begin construction on a $1 billion mixed-use development—Mercer Crossing—which will bring homes, an office building, and a retail center to a key tract of land in Farmers Branch. The construction work—including water, sewers, drainage and interior streets—is slated to begin in late March, with an official groundbreaking ceremony at Luna Rd. and Whittington Ln. 174 acres of single-family homes, with construction beginning on the first 651 home lots in a rolling production to fill out six residential neighborhoods. 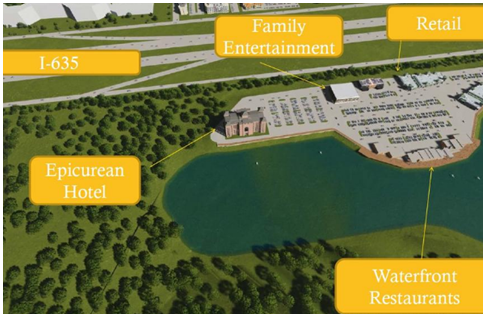 Additional apartments, a hotel and a 20-acre power center with a neighborhood grocery store is slated to go before the city's planning and zoning department later this spring. In all, the project is zoned for 2,250 apartments. ​Want ​more data? See DFW Retail, Housing, and Office Market Research.